Harry Minnett was born at Hurstville in Sydney on 12 June 1917 and lived there until he married in 1955, just prior to being posted to London in 1956. His parents were Frederick Harry Brook Minnett, a nurseryman (born in Paddington, September 1887) and Elsie May Garnsey (born in Dubbo, July 1891). Following their marriage, they established a delicatessen business at a time when Hurstville was expanding. Harry attended Hurstville Primary School and was Dux in his final year in 1929. He then attended Sydney Boys’ High School, 1930-34. Harry had a brother Bruce who was nine years younger. At an early age Harry was captivated by technology, and at around the age of 15 built a short-wave radio set to listen to overseas stations. This more than anything is seen to have sparked the passion that marked out his future career and dominated so much of his life. He studied science and engineering at the University of Sydney, where the Professor of Electrical Engineering was the far-seeing JPV Madsen. Harry graduated in Science (Mathematics and Physics) in 1939, and in Engineering (Mechanical and Electrical) with First-Class Honours in 1940. In April 1940, Harry Minnett joined the Council for Scientific and Industrial Research (CSIR, renamed CSIRO in May 1949), soon after the establishment of the Radiophysics Laboratory for research into advanced radar systems. He remained with the organisation until his retirement in 1981. 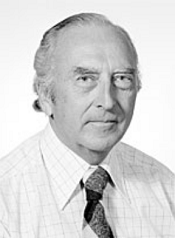 In September 1978, Harry was appointed Chief of the Division of Radiophysics for a period of three years, after which he would reach retirement age. In addition to his normal duties as Chief, Harry played a major role in guiding a preliminary proposal for the next-generation radio telescope then called the ‘Australian Synthesis Telescope’. He was also involved in the search for a new Chief who would not only carry forward the concept of the new telescope, its implementation and funding, but would take a lead in initiating new research directions for supporting Australian industry. The position was filled by RH Frater. Harry retired on 26 June 1981 and was appointed a Senior Fellow in the Division of Radiophysics until 23 October 1981, when he was made an Honorary Fellow until 30 June 1982. Harry died on 20 December 2003 after a short period of illness. In 1947, he teamed up with JH Piddington to carry out the first significant radio astronomy observations at microwave frequencies. While Piddington tended to concentrate on the theoretical aspects of the new, microwave radio astronomy program, Harry’s main efforts were directed to developing the observing equipment and in observing, although he also participated in the analysis of the results. The radiometers that Harry had developed were, at that time, the most sensitive and stable in existence and made possible the first systematic observations of the Moon, Sun and Galaxy in the microwave region of the spectrum. In 1952, Harry was appointed leader of the Microwave Navigation Group. He made an experimental study in collaboration, with Don Yabsley, on the feasibility of long-range automatic distance measuring equipment for aircraft navigation using ionospheric propagation. He was also responsible for the development of microwave radar for the measurement of vehicle speed for the New South Wales Police Department. This development would be interesting to review, given the current interest in such devices; perhaps the work was done before all the underpinning technologies were available to give adequate portability? his contributions to the Interscan aircraft Microwave Landing System developed by the Division of Radiophysics in collaboration with industry. A full description of the construction of the Parkes radio telescope is available by following the link Parkes radio telescope construction. Much of his work is described at the following link: Antennas for radiotelescopes and satellite communications. An Anglo-Australian Joint Policy Committee (JPC) recommended that the UK and Australia jointly fund the construction of a 3.9-m optical telescope in Australia, to be called the Anglo-Australian Telescope (AAT). The project office for the AAT was established in Canberra in 1967. Together we visited the major astronomy centres in Britain and listened to the conflicting and often discouraging requirements of the optical observers. I persuaded the Science Research Council that Ford should accompany me to Kitt Peak where we found a proposal for a digital servo drive to the traditional worm gear system. Harry became convinced that the only way to make a major advance in optical telescope drive systems was to eliminate the inefficient worm gears from the servo loop, together with the reverse-torque spur gear system that had gradually evolved for anti-backlash purposes. His proposal was to replace these with a precision spur-gear driven by a balanced pair of motors and pinions in the push-pull anti-backlash arrangement that had become common in radio telescopes. Harry’s experience with the design of the Parkes servo system also suggested that the struts connecting the horseshoe structure to the north-end bearing were too flexible and would lead to a low-resonant frequency. The AAT strut structure was completely redesigned for greater rigidity by consultants in Canada. All these changes represented a major rethink in optical telescope drive and control practice and in such a large project could only be advocated after a good deal of anxious soul searching. A great amount of effort by myself and ultimately by many others was needed with the gearing manufacturers and the Japanese drive and control contractors to achieve the high precision required. Mike Jeffery, the Project Manager for the AAT, died suddenly in September 1969 and Harry was seconded to the JPC as Project Manager. He was responsible for supervising all aspects of the project design and construction, and contracts with local and overseas contractors. This included the optical structure, mechanical and electrical design and manufacturing work on the telescope, its building together with ancillary equipment, and the civil works on Siding Spring Mountain, New South Wales, that were carried out by MacDonald, Wagner and Priddle Pty Ltd. Harry travelled to England and the USA in April-May 1969 and in July 1970. When a new Project Manager took up duty in the last half of 1970, Harry overlapped as an adviser for a further year. He then returned to his consulting role on the drive and control system. When Paul Wild was appointed Chief in 1971, he took the opportunity to participate in an international competition by the International Civil Aviation Organisation (ICAO) to design and construct a microwave landing system (MLS) for aircraft. Wild assembled a small team to propose and develop a new system. The project had financial support from the Commonwealth Department of Transport. Other competing groups were three large teams in the USA and groups from the UK, France and Germany. For decades the aircraft approach system used worldwide had been in the VHF frequency band. The ICAO required a much more precise system operating near 5 GHz. The system was required to define appropriate landing paths that could also automatically land the aircraft. If landing was aborted, it would need to guide an aircraft away safely. Wild, who had an outstanding grip on the basic principles of physics, was quick to come up with a time-reference scanning-beam system as a possible solution to the MLS; this was called ‘Interscan’. In 1972, he appointed Harry as Engineering Director for the Interscan MLS project. Wild and Harry had complementary expertise and both had enthusiasm. Harry’s role as Engineering Director continued through the feasibility studies in 1972, and during the design definition phase in 1973 when the Australian company AWA was awarded a contract from the Department of Transport to engineer and manufacture a system for flight trials at Tullamarine airport, Melbourne. Harry’s antenna expertise was called on particularly for the conceptual and design phases. One of the antennas was an electronically scanned torus reflector. He wrote: The vertical profile of an azimuth reflector was shaped by synthesis techniques to produce a very sharp cut-off along the ground and an optimum shape at other vertical angles. The technology developed for the new surface of the Parkes radio telescope was directly applicable to all the reflector antennas for Interscan. During 1974, Harry travelled widely to advocate the Interscan MLS system. At the end of that year, the US Government conducted a four-month evaluation of the British doppler system and the Australian Interscan system. Through negotiation, the US would collaborate with the country that they saw as having the best system. This would then undergo further development prior to submission to ICAO. The US decided in favour of the Australian time-reference scanning-beam technique, giving the US and Australia a common technical platform in preparation for the final submissions to ICAO. As part of the program to improve the Interscan system, Harry proposed a concept for correcting the cylindrical aberration of the torus reflector. The correction was implemented in the electronic modulation and switching system that produced the quasi-continuous beam scan. This reduced the overall size of the antenna by almost one-half. The Department of Transport entered the Interscan MLS system into the international competition conducted by ICAO, and in 1976 it was selected as the winning entry. Unfortunately international politics was later to plague the project, resulting in a reduced role for Australia. One significant spin-off was the formation of a company to commercialise aspects of the Interscan MLS sytem. This Australian company was called Interscan (Australia) Pty Ltd but was later renamed Interscan International to promote the sale of its products, including phased-array antennas, on the international market. In 1982, Harry became consultant to Interscan (Australia) Pty Ltd at the invitation of the Managing Director (J Drennan). The Interscan (Australia) engineering team had just spent two years in Kansas City, USA, working with Wilcox Electric developing an MLS using phased-array antennas, which had displaced the original CSIRO reflector antennas. This joint effort was aimed at satisfying the Federal Aviation Administration (FAA) specifications followed by submission of a formal response to the FAA’s Request for Tender. It was then a matter of urgent commercial necessity for Interscan to obtain other engineering work to support the team while the tender was being evaluated. As it later transpired, Interscan (Australia) was unsuccessful in being awarded a contract and the need for new contracts became more pressing. Although Interscan (Australia) was unsuccessful in its bid to the FAA for MLS, it was successful in selling the systems in Spain, China and Taiwan, and in the USA to non-FAA customers. Harry’s task was to search for suitable opportunities. His first success came with a proposal for a long-range VOR (Very-high-frequency Omni-Range) antenna. This was the first task outside MLS to be undertaken by Interscan (Australia). Some twenty systems were subsequently sold to the DCA. An additional task undertaken by Harry was the design of a precision ground-reflection antenna range using the old landing strip at Fleurs, Badgery’s Creek, New South Wales. This range was intended to be used for production testing of MLS antennas. The units were tested on the range to a precision of 0.001 degrees in guidance accuracy. Another project in which Harry was involved, this time in association with BB Jones, was the conceptual design of an electronically scanned TACAN (Tactical Air Navigation) antenna for use by the Royal Australian Air Force. This antenna consisted of a cylindrical array fed from a 36-way Butler Matrix using electronic phase shifters. It was a very successful project both commercially and technically. Harry became Deputy Chief Executive of Interscan International in 1985 and retired from that position in July 1986 at age 69. … Harry was very thorough in every task that he undertook and was analytically precise. He would invariably follow the subject through with extreme attention to detail, often to the frustration of those working around him. Of course, this was to stand him in good stead when the need arose. Harry was a person of the highest integrity, had professional competence of a high order in many different fields of engineering and science, and made outstanding contributions to science through engineering. Harry was never the ‘centre of attention’ at staff parties, preferring to discuss engineering in the corner of the room with colleagues. He had very little time for ‘small talk’. A full account of the life and achievements of Harry Minnett can be found by following the link in the Source details below.